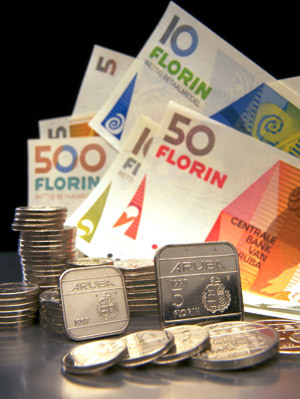 To change florins to US dollars, divide florin amount in half and add 10%. This formula will be especially useful when shopping in supermarkets. All major credit cards and travelers checks are accepted. 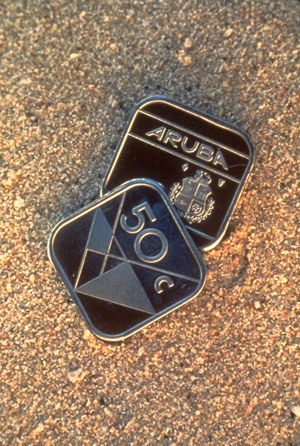 Personal checks from out of Aruba are not accepted. Some shops will not accept US $ 50 or US $ 100 due to worldwide counterfeiting. The service charge at a restaurant is shared among servers and kitchen staff. If there is a service charge, a tip is not obligatory but a token amount left for excellent service is greatly appreciated. If there is no service charge, a tip is appropriate as in the US (+/-15%). Room tax and service charge vary at each hotel, adding an additional 19 -22% to the room bill and a $3 environmental charge. A turnover tax (BBO) of 1.5% and 2% health tax (BAZV) are either added to or included in the price of all goods and services.